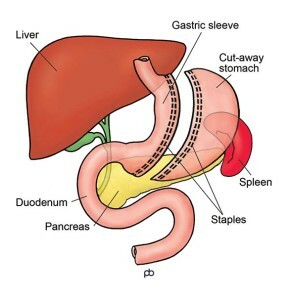 What is a sleeve gastrectomy operation? About 1 in 4 weight loss operations in UK are sleeve gastrectomy (also called gastric sleeve). The operation is done by laparoscopy (keyhole surgery) under general anaesthesia in Leeds. It takes 1-2 hours. The stomach is a large sack that has a capacity of about two pints. Surgical staplers are used to change the stomach from a sack into a thin narrow tube. Surgical staplers are special surgical instruments that cut and seal the walls of the stomach simultaneously. The stapler is coated with a special material, called buttressing, to increase strength and reduce bleeding. During the operation, a special tube called a calibration bougie is passed from your mouth into your stomach. The bougie guides the stapling so that the sleeve is of the correct size. 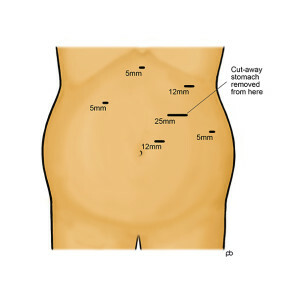 The cut-away part of the stomach is removed from your abdomen through one of the keyhole cuts that is enlarged slightly. The recovery is quick. 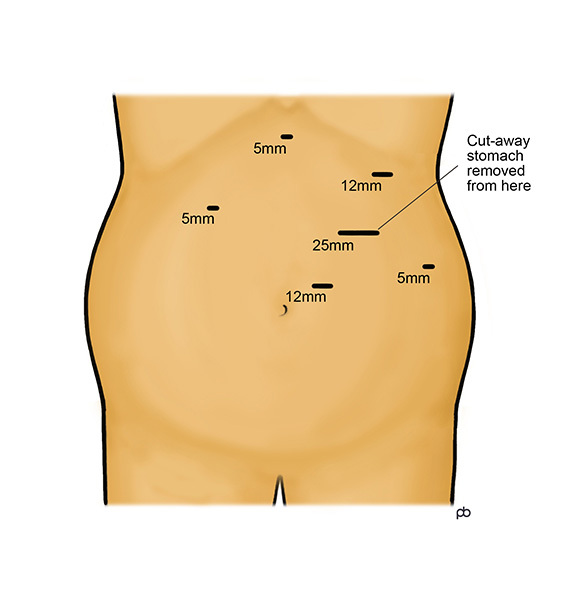 How does a sleeve gastrectomy work? The gastric sleeve gives you a feeling of fullness after eating a small meal. Also, it controls your appetite so you do not feel hungry until it is time for the next meal. These effects happen because the gastric sleeve reduces the working size of your stomach. This is called the restrictive effect of operation. Also, there are changes in the levels of several hormones that control your hunger, fullness and blood sugar levels. These hormones are released from special cells in the lining of the small bowel and the stomach. Because of these changes in hormone levels, you can feel as if a switch has been turned off in your head. Your hunger is reduced and you feel fully quickly after eating. How much weight can I lose with the sleeve gastrectomy? Your weight loss will depend on your starting BMI and gender. Please remember that there are no guarantees in weight loss surgery . If you are a woman and your BMI is less than 50, you could lose about 70% of your excess weight (%EWL). If your BMI is more than 50, the average weight loss is lower: about 50% EWL. If you are a man and your BMI is less than 50, you could have 60%EWL . If your BMI is more than 50, the average weight loss is lower: about 50%EWL. Weight loss takes place during the first year after the operation. After this time, weight-loss stops and you have reached your new weight. This new weight is called the plateau. You could imagine that the sleeve gastrectomy has reset a weigh-thermostat in your body. The sleeve gastrectomy helps you to maintain your new weight once you have reached your plateau. What is the follow-up care for sleeve gastrectomy? You will be given advice by Mr Sarela, dieticians, nurses and other healthcare professionals. It is vital that you listen to the advice and discuss any problems or concerns. The dietician is a particularly important person. She will give you detailed instructions. Please keep in regular touch with the dietician. You will need to take a multi-vitamin and mineral capsule, calcium and vitamin D combination tablets, and iron tablets daily. For the first 4 weeks after the operation, you should take these medicines as syrup or dissolvable tablets or chewable tablets only. Afterwards, you can take whole capsules or tablets. Also, you should take a vitamin B12 injection every 3 months. You will need to see your GP to get a prescription for these medicines. A detailed discharge summary will be sent to your GP, explaining the medicines and follow-up tests. Please make an appointment to see your GP soon after your operation. The drugs need to be taken life-long. The dosage may need to be changed, according to results of tests. Also, you may need other medicines, based on test results. You will need to have blood tests regularly at your GP’s centre. The tests should be done 3-monthly during the first year, and then one-yearly. The tests may have to be repeated more frequently if some problem is found. Detailed information will be sent to your GP to request these tests. Please contact your GP’s centre to make appointments. For more information about follow-up medicines and tests, see the British Obesity & Metabolic Surgery Society‘s guidance. 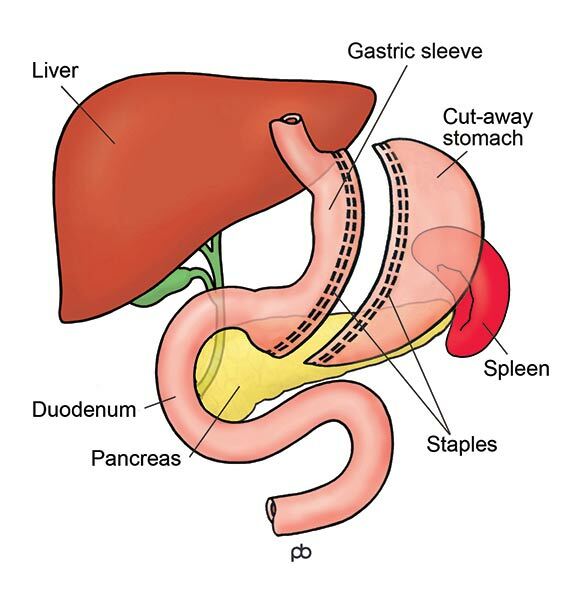 WHAT ARE THE RISKS FROM A SLEEVE GASTRECTOMY OPERATION? Think about overall risks from weight loss surgery and risks for specific complications from sleeve gastrectomy. Bleeding can happen from blood vessels that had to be divided during the operation or from the staple-line on the gastric sleeve. Bleeding that is obvious during the operation can be controlled. But, bleeding can sometimes develop after the operation. Post-operative bleeding usually happens within the first 24-48 hours after the operation. Bleeding can happen from the outside or from the inside of the staple line on your gastric sleeve. If bleeding is from the outside of the staple-line, the blood collects within your abdomen (tummy) and usually causes pain. If bleeding is from the inside, you may bring up blood or pass blood in your bowel motion. Another keyhole operation (re-laparoscopy) or endoscopy and blood transfusion may be needed for the treatment of post-operative bleeding. Bleeding happens in about 1-2 in 100 operations. Leakage means that stomach juices seep into your abdomen (tummy) and cause serious infection (called peritonitis). Leakage happens because of a weakness or gap in the staple-line on the gastric sleeve. The staple-line is tested carefully with a blue dye to check that it is watertight. Leakage usually becomes apparent during the first few days after the operation. But, occasionally it can remain silent for some weeks. Leakage will declare itself with pain in your abdomen (tummy), fever and make you feel generally quite unwell. The treatment of leakage depends on the severity of the infection. If there is collection of infected fluid around your stomach, insertion of a drainage tube under x-ray guidance may be sufficient. For more serious or generalised infection, further surgery (re-laparoscopy) and endoscopy with placement of a stent may become necessary. You will need nutrition by a tube placed through your nose or into a vein until healing is complete. Leakage happens in 1-2 in 100 patients. Stenosis or excessive narrowing of the sleeve gastrectomy can happen because of twisting or ‘cork-screwing’ of the stomach during stapling. If the sleeve is too narrow and obstructed you can get vomiting. You may need to have x-rays, endoscopy, nutrition through a tube or vein and another operation. Stenosis is a rare problem. The gastric sleeve stretches so that it has a bigger capacity and produces less restriction. There is very small risk of forming ulcers in the sleeve and developing a narrowed sleeve (stenosis) that causes blockage.